Horseback riding can truly bring you closer to nature than ever, amidst the peaceful solitude and incredible beauty of the Rocky Mountain back-country! Here you will learn all about the lifestyle in the West as the cowboys will guide you through Banff National Park, the photographer's haven of the Canadian Rockies. These pack trips take fellow adventurers deep into the heart of the rugged North American wilderness to explore some of the most spectacular landscapes. Soak up amazing views of Stoney Creek as you trot through the wilderness, keeping an eye out for deer, elk, and moose. The clanging of the dinner bell each night will bring all to our delicious ranch-style meals in the giant kitchen tent. The coffee is always on and kept hot on the wood stove, ready and waiting! The camps you’ll be staying in go far beyond rustic. Curl up in a heated A-frame canvas tent set on a raised wooden platform and listen to the sounds of the forest as you drift asleep. In the morning, freshen up at the wash stand (complete with hot water) and then enjoy a meal prepared for you in the giant kitchen tent. The horses, chosen especially to meet your needs and experience, will win you over with their charming personalities and amaze you with their versatility and trail abilities. You will no doubt form a "partnership" during your ride and come to respect your new friend immensely! Begin from Mt. Norquay corrals - Ride over Elk Summit. Lunch at Elk Lake, Camp at Stoney Camp. Day ride from Camp to Dormer Pass. Includes 2 nights at Stoney Camp, day ride and fully catered dining through out the trip. Return to Minnewanka corral. The historic elk corral or wild goat trap should provide you with plenty of opportunities to see the abundant wildlife - most commonly the elk, deer, bighorn sheep, goats, eagles - and capture them all on film! And if you are lucky, your may also get the occasional bear or timber wolf sighting! The riding is casual, with plenty of breaks and leisurely picnic lunches. Lunch breaks also lend you time for some exploring on foot, fishing and even a well deserved snooze in the tall grass! The adventure begins at the stables at 8:30am (please do not arrive any earlier than 8:30am). There’s free parking at the stables and it’s fine to leave your vehicle for the duration of the tour. We’ll hand out the slickers and saddle bags and you will leave all of your gear with our guides. Your sleeping bag and pillow should be packed in a soft sided bag (the traditional “duffel” style of cowboy packing). A separate string of mules will safely deliver your belongings to the camp for you so that you can ride unencumbered. When you arrive, your “duffel” will be waiting for you so that you can grab it and settle into your tent. 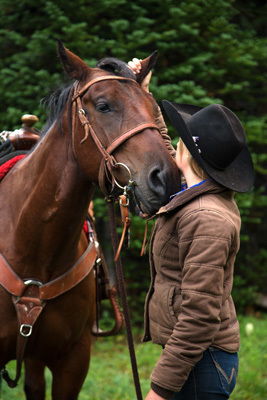 Once you’re all checked in, we will take you by van to the very fringe of the front country, the trailhead corral at Mount Norquay to meet your friendly guide and the trusty horse we’ve specially chosen for you. Then you’ll mount up for the 13 mile ride through the stunning scenery of Elk Lake Summit. This is the launching point to heading completely off the beaten track into Banff’s wildest places that most tourists will not get to see. The climb to Elk Lake Summit is jaw-dropping, you’ll be wide-eyed with awe at the larger-than-life mountains with their jagged edges piercing the sky. You’ll pass through the cool, craggy peaks of Brewster Mountain and Cascade Mountain, then head down into Stoney Creek Camp (stopping for lunch at Elk Pass Summit along the way). This historic camp was named by the First Nations people and is deeply historically and culturally significant. It’s only day one and you’re already more deeply immersed in the backcountry than most Banff visitors will ever get. Life at camp is simple, yet comfortable. It is a rustic, yet well-equipped camp that is shadowed by the jagged peaks of the Palliser Mountain Range and you’ll always be able to hear the gentle murmuring of the nearby creek. We will cook up a feast of hearty, homemade cowboy cuisine and gather around in the main kitchen tent, which acts as the communal hub of the camp. In the evening, we will gather around a crackling fire to watch the stars and share stories. Then, it’s time to curl up in your sleeping bag in your canvas tent with cot, heater and thermarest and get some sleep – the adventure has only just begun. Stoney Creek Camp is the jumping off point for many different rides into the backcountry, each more spectacular than the last. You will be traveling along the trails that were once used by the wardens to patrol the boundaries of Banff National Park, the true outskirts of the Canadian wilderness. Your guide will create a customized ride for your group today, tailored to your interests and experience. This ensures that your adventure is a bespoke, VIP experience that is just right for you. There’s no feeling quite like being deep in the Canadian wilderness like this. No matter which direction you headed in, you could wander for miles in pristine, unspoiled wilderness without seeing another building, person or trace of human civilization. It gives you a sense of the immense scale and power of nature in the Rocky Mountains. A cowboy trail lunch will be served along the way, so you can sit and enjoy while admiring the mountain views. After a full day of exploring, you’ll arrive back at Stoney Creek Camp to settle back into your comfortable, familiar heated tent for the night – after another tasty camp dinner. Arise early and say goodbye to your pristine backcountry surroundings – it’s time to head back into Banff and rejoin civilization. Most of our guests are reluctant to leave the isolated, tranquil beauty of this off-the-beaten-track spot. Unfortunately, every adventure has to come to an end. We’ll top off this trip with a thrilling 8 mile ride from Stoney Creek Camp to the Minnewanka Pack Station, stopping for lunch by the riverside along the way. It’s time to say goodbye to your guide, your new friends and your horse. Many guests say that the bond they formed with these gentle animal companions was something they will never forget! You’ll have plenty of wild Banff backcountry stories to tell and you will have earned the bragging rights to say that you spent 3 days deep in the Canadian Rockies. The shuttle will be waiting to take you back to the stables for approximately 5:00pm, where you’ll say goodbye to the new friends with whom you shared this unforgettable adventure into the wild. Equipment Rental email Bactrax/Snowtips at http://www.snowtips-bactrax.com/, for information regarding sleeping bags/liners, luggage bags etc. Located at 225 Bear Street, Snowtips offers a convenient rental service. They are open from 8am until 8pm, and would love to receive your inquiries. If you would prefer to contact them by telephone, they can be reached at (403) 762-8177. This is a pack trip and both nights will be spent at one campsite. Each camp is set up with heated A-frame heated canvas tents on raised wooden platforms with padded cots (no need to being your own mattresses). Large cozy kitchen tents provide a place for meals and socializing. Rail corrals keep the horses contained and happy. Simple luxuries abound such as wash stands and hot water, and even heated tarp tent showers, make for cozy accommodations. Rivers flow nearby for the fishermen or brave swimmers. We have a generator at all camps in case you need to charge phones/ batteries. All meals from lunch on Day 1 to lunch on the last day are included in the trip. Both camps are fully catered and include live-in cooks, who all love to show off their backcountry culinary skills. The clanging of the dinner bell calls all to delicious ranch-style meals. Coffee is always on and kept hot on the wood stove. Gather inside the big kitchen tent to dine on succulent steak or chicken. Limited wine and beer is available for purchase. There’s plenty of table space inside too, including room for card games when the sun goes down. Although we can cater to some specialty diets, we do not cater specifically to vegetarian diets. There are always plenty of meat-free options available. However we do not offer a “vegetarian” main course.